Project 52 – A portrait(s) of my child once a week, every week in 2014. I had a hard time deciding between the above photo and the one below for the picture this week, but Dave liked the top one best. This is the first toy we have actually bought for Lucy, surprisingly (or not surprisingly, if you knew us). We’ve had some things given to us and with the exception of her exersaucer they are all very small. We have been wanting to be very intentional with her toys. Everything she got from us at Christmas was handmade by us (which reminds me…I still haven’t shared that!) and we have worked hard to keep the number of toys at a minimum for two reasons: 1) I don’t want her to grow up with an attitude that everything is expendable. I’d like for her to appreciate what she has. We’re hoping that the best way to cultivate that is to buy a lot higher quality toys less frequently. Less is more, right? And 2) On a practical note: We have a TINY house. We have to push our coffee table aside for her to play, it’s that small. I’d like to not have it crowded with every kind of toy possible. My rule of thumb for her toys is: One big toy, and a basket of small toys. Right now we technically have two, because her exersaucer is still out (but I’m anxiously awaiting the day I can put it in storage) Luckily the activity cube is small enough that I can put it in a corner when she’s asleep. Plus it’s not ugly so that’s a bonus! This activity cube is from a company called B. Toys and it’s available at Target. It’s exactly the kind of toy that we’ve been looking for, and Lucy LOVES it! It’s meant for babies 10mo-2years, but Lucy seems very entertained by it despite only being 8.5 months. She loves to stand at it and push the beads around, on one of the sides is the alphabet with squares that flip to reveal and animal (she likes to make them spin) and there’s also little doors that she likes to open and close. PS: Look at this child standing. We’ve tried and tried to get her to crawl and she is close, but I don’t think she’ll crawl long before she walks. That. That is this little girl. I’ve heard it over and over from parents of preemies and babies with health issues; the doctors say: “Don’t expect much from this one.” Over and over again though, it seems these are the ones that are the most feisty. Today it’s been exactly 3 months since her open heart surgery. If not for that pink scar down her front, who would know? She is so full of life. Her doctors could hardly believe it when she was sitting unassisted at 7 months (or 5.5 gestational months) She holds herself up at the coffee table, and loves to stand (and tries to by herself often). Now? At 6.5 gestational months, she is desperately trying to crawl. It’s resulted in many a bonked head though as she doesn’t quite have the arm strength–but I’m sure it won’t be long. Check out the determination on that little face. I’ve seen a couple pins on pinterest showing how to make a toddler dress from a mens button up shirt. I liked the idea, but wanted to make something a bit more detailed. I was also frustrated with the lack of blue girls dresses, as well as dresses without cartoon characters, logos or words. I found this boys size small button up for $2 at the thrift store and loved the blue gingham, and lucky for me, a boys size small neck fits my chubby baby girls neck perfectly! This DIY is great if you are already pretty familiar with the sewing machine. If you want to avoid what I did in the first picture, get your screaming baby to stop crying first. Sew a baste stitch along the top of the skirt section and gather to fit the bodice. I did this in panels (the back, and the two front panels) in order to keep the gathering even. Pin to the bodice, and sew. Finish off arm holes. I also hemmed the dress (but left the fabric). I left some room to take out the dress at the sides, as well as the bottom because I want the dress to grow with her. I also used bias tape to finish off the seam at the waistline on the inside, as well as in the arm holes. I like to have baby clothes as sturdy as possible, because they need to be able to get thrown in the washing machine without me worrying about the edges fraying. The sash around the waist was an afterthought (so I didn’t photograph instructions). I noticed the cuffs from the arms had a smaller gingham fabric and thought that it would be cute to use as a sash. I cut them off, opened up the seam to remove the raw cut edge and re-sewed it shut. I then sewed them together at the from, and used the button holes to attach an adjustable tieback. I sewed on two of the buttons down the front of the sash where the seam was. Just a little eye candy for today. I was a painter before I was a photographer, so when shooting for art I tend to not worry about focus points as much as light/form/feel. That’s probably why I like editing so much, because one image can go so many ways. These were originally edited as black and whites, but on a whim I did one to look like expired film and loved the soft pinks and oranges that came from it…. “Bloom” is the May writing prompt of The Mommy Blogger Collective. In addition to a monthly writing prompt, the collective hosts a monthly blogger featurette. 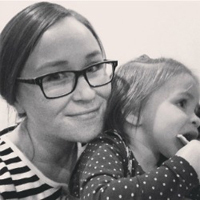 This month we are featuring Misty of Momista Beginnings. A few words from Misty — I’m Misty, the southern California blogger behind Momista Beginnings. I began this blog while pregnant with Mia over two years ago to create a space for mamas out there to connect with their inner “momista.” According to me, a momista is a devout follower and lover of motherhood who takes her role to the next level. She uses her strengths to create the best childhood for her kids through activities, traditions, adventures, exploration and experiences. My blog aims to inspire all of this. Other bits of me make up my blog as well, like my passion for photography, art, crafts, my love for baking and cooking and family updates. I’m an ex art teacher of over 10 years and my art projects for kids make appearances from time to time, too. You can also find me on Bloglovin’, Instagram, Facebook, Twitter and at my photography website and its Facebook page!